Home→QUIZ: Are You Right for Writing? Hello! I’ve been lurking on the site for years. And now, my interest in writing has reignited, and I plan to make writing a habit. I currently have a premise or idea for a story, how would I going to make it big to create a novel? Thanks. Getting the story idea both right and writeable — and then keeping it that way, is a huge part of creating anything really good. Well, I tried to answer each question honestly and sometimes the truest answer was a combination of answers. But scoring conservatively I hit 69 and am happy with that. This first challenge is interesting since I’m one of those people who never wants to show people what I’ve written. I’ve had some dismal experiences with sharing on websites, but I will trust that Holly will keep this civilized. 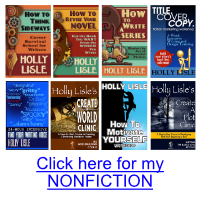 I’ve been lurking on Holly’s site for years so I’m finally stepping up and doing the work. Members over at HollysWritingClasses.com are warm, wonderful, helpful people. If you want to get a lot of writing done with other folks who love doing what you do, you’ll fit right in. My 72 gives me hope… not that I didn’t already have that, it just boosts what I had. I feel as if I’ve opened a door into a cool new place, and looking around has me very intrigued. At 50, I’ve wanted in my soul to “be a writer” since at least the fifth grade. The problem has always been a matter of practicality; you see, my mother, who comes from a long line of practical women, was a shining example of the wisdom of Being Smart (i.e., don’t do risky things with your life and your career when sticking with the safe path will get you into a good place). So, I’ve been smart. I went to nursing school (high-five Holly) and now work in healthcare IT and make good money and have good benefits and a great schedule and I’m so unfulfilled I could pop. I’ve dived into various pools of creativity such as painting and jewelry-making nd gardening, but always have the writing bug tickling the inside of me. My writing starts and stops haven’t gone far, but it’s TIME. I’m so happy to have found your place, and to see where I can go! Astounding how many folks get talked out of their dreams by the well-meaning. Write! It’s hard work, but it’s wonderful work. You can do it. Fifty is not too old. Seventy is not too old. Where writing is concerned, the only time when you’re too old do do something you dream of doing is when you’re dead. Here’s a quick freebie workflow for getting started. This is stuff I cover in more detail and a LOT more depth in my classes, but this will definitely get you started. So… I’m 11 and I’m currently working on writing a novel and I got a score of 73, if I did the math correctly. I have a couple questions as to writing. Everyone that I’ve shown my writing to, including my teachers, said it was great. In class, for any creative writing, I have an average length of the story being 7 pages long at a font size of 14. Ok, back on track, so first of all, if actually write a semi-decent novel, is it realistic for me to get at least $100 in total, considering the fact that I’m only 11? Also, my novel is basically about “The Chosen 15” and blah blah blah, but what do you think is the maximum amount of characters to have in a novel? Thank you so much! First thing you need to keep in mind is that unless your school teacher is a published author, your teacher does not know what makes fiction publishable. It isn’t what teachers in grade schools teach. The first things I had to unlearn before I could start selling my fiction were all the rules my school teachers taught me about writing. Once you’re past that hurdle, however, novels run around 50,000 words in length and up. At seven pages and at about a hundred eighty words a page (assuming you’re double-spacing and have one-inch margins on your pages), your current story length is about 1260 words. Assume that with your current set-up, to write a novel you’re going to need a story that runs about 277 pages. It’s doable. It requires thinking of bigger stories — and when you’re getting started, it’s a lot easier and more productive to focus on writing a lot of shorter stories, learning how to fit good characters and good conflict into that length, and working to find markets where you can sell those. There used to be magazines that specialized in fiction by kids. I’m not sure if there still are — a lot of magazines died when the Internet really took off. But look around, find places where you like the fiction they publish, and contact these magazines to inquire about how to submit your work. And good luck. There are folks your age (and a bit older) who have successfully published. And time is on your side — focus on learning the craft, on telling good stories about characters you love, and on being persistent — on NEVER quitting. You can do this. “Interesting.” Background requirement for folks wanting to have an easier go at writing for a living. Good luck with that cabin in the woods. I want one of those, too. I would love the opportunity to reprint this my in newsletter. Monthly Conversation. This year we are following the journey of becoming an author and this quiz will fit well as we begin in January. I hope this posting is appropriate and reached you for review and consideration. I could not find an email address for direct communication. Sure. You’re welcome to reprint. Please include in the credits, Copyright Holly Lisle – HollyLisle.com, All Rights Reserved. Used with written permission of the author. I got a 50, which is all right for me. I’m retired so the “so I can quit my job” doesn’t really apply. The empty room for an hour – well, I’d probably fall asleep. Then again, my mind is so full of left turns as 60 mph, maybe I could come up with some more interesting ideas. I have finished one fantasy book of a projected 5 book series. A friend read it as I wrote it, almost – she got the latest chapter every Monday after I wrote on Sunday. But – I never got it edited. I have started thinking about giving editing another go. In the mean time I have the second book undergoing an outline process and I’m doing some editing at the same time. I’m a long time fan of you, Holly and I believe I have all or almost all of your classes. BTW – I’m 69 and going strong. I got a 56. What a fun thing to go through. I’m still trying to finish my first book, and have to go back and replan the middle section, as I found the sections I spent more time planning were earier to write. Holly, thank you for creating your Working Tour, and this quiz. I scored a 77, affirming I’m on the write track! My second novel in its first draft is fiction. Its been an incredible eye-opening journey, transforming an idea into a spine-tingling story readers can’t put down. Searching online for fiction scene break-out and structure, led me to your website, and book, How to Write Page Turning Scenes. Such hidden gems, everything clear, concise, and easy to follow. I’m excited and enthusiastic about this working tour. I got a 59. Though, the first question was kind of unfair. If you hadn’t taken away my radio, I would have answered D. Without music, I gave myself a B. I’d go crazy in that room in the question, not from boredom, but from my overactive imagination. When it’s quiet is when my brain gives me serial killers coming to torture me to death. A 92. I want this more than even I can imagine. This was really encouraging. Thanks! Scored an 81. This is what I’ve always wanted to do. I started writing when I was 4 – first story posted on the bulletin board at kindergarten. Then life happens. Wrote poetry, music and songs (minor fame for a song I wrote for my historical recreation group). Got started in serious mode for NaNoWriMo 2912 and won, despite 2 car accidents and a week-long, unrelated hospital stay. (Did I mention I’m also a Taurus?) Still working on that, because it grew legs and projects to be a 6 book series… plus 4 other books that have presented themselves. I’m about to be 65 years old. Other people started late, so why not me? 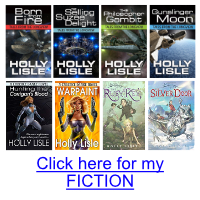 I write Sci-fi empowerment. I’m not writing for money. If even ine person reads my story and feels encouraged, i am well-paid. I got 60, but I’m not really sure how to answer #6. I answered B, but that really isn’t true because I haven’t worked full-time since I was diagnosed with MS three years ago. Fortunately, I can still work part-time doing something I love to do (teach guitar). So I feel like I didn’t really fit into any category. I have more time to write, so I write. Not because I want to quit my full-time job (that doesn’t exist), but because I finally have enough time to do what I’ve wanted to do for decades. Now I just need to prioritize all the other activities that seem to constantly clutter my days, and then get rid of the ones that aren’t really adding value to my life. Oh my goodness, that’s hard to do! There are so many things that I really CAN’T do now, so it’s really hard to say “no” to something that I CAN do but maybe shouldn’t. I got a 46. My urge to write comes from sharing my life experience. I am constantly thinking about life, existence and purpose. Then i’ll jump to a movie idea or jump again to the crazy guy I saw on the bus. I have this urge to write it all down and share it. I cannot be the only one to benefit form all of these thoughts and experiences. I got 60, I know I have the perfect ideas for short stories and novels but the challenges I usually face are with my concentration and grammar. Performing an activity and sitting at a place for long is a huge challenge for me. I also feel my style of writing, structure and grammar need improvement. Is anyone aware of an online class that will help with my writing. Writing is a learn-by-doing process that generally benefits from intelligent feedback from other folks doing the same thing. In it, I teach story structure, plotting, how to come up with good endings, and a few other basics. It’s self-paced. I got an 80, and I’m actually a little surprised in myself. I’ve always been kind of a daydreamer, I guess. I’ve been told I’m good, but friends and family kind of have to say that. Wouldn’t want to discourage me, now would they? I guess I’m afraid that they aren’t honest, and that’s why I’m here. As of recently, I’ve joined a writing group. Unfortunately for me, this being my first year as a part of it, they can no longer do real competitions due to the unfortunate death of someone who was very important to it, sometimes going to help as many as six competitions in one day. Even so, some schools nearby are coming together soon for a small competition. I’m still going though. For my English class, we wrote a paper about World War I to be submitted to a contest. I chose to do a fiction story, which I was actually really worried about. Soon enough my teacher came up to me at the start of one class and praised my writing. She told me that she really enjoyed it, which was enough to make my day. She actually encouraged me to join the writing group and asked me about it a couple of times. More recently, I wrote a very small writing about a painting provided in art class, as the assignment for the first five minutes of class was to write a fiction about the painting. My art teacher later read my writing to the class and told me that had had already talked to the advanced teacher, and they planned to submit it into a contest, which was also really huge for me. I guess a part of me is still telling me that it isn’t possible I be talented at something. This was definitely reassuring, and I’ll try to get rid of any doubts. It’s a lot harder to write anything when you’re always second guessing yourself. 64…yeah, I’m getting varied reviews of my first story, but I’m still clear in the right path for my career. I got a 50, which I suppose is a borderline grade. As a seventeen-year-old, I’ve not had a tremendous amount of teaching, but the craft as a hobby and as a career intrigues me. My only question is how far will sheer discipline get you on this path? If a rookie who has only ever written brief articles and short-stories dives into courses to improve his knowledge of the art and sharpens his skills through more focused writing sessions, will he go anywhere as a writer? What part does pure, natural creativity and talent play? Not having received a college degree or fully committed to a career, I’m sort of at a crossroads where writing seems like the ideal yet unrealistic journey. Thanks for the wonderful quiz — I agree that this is infinitely more helpful than any garbage Cosmo can come up with! I, too, live in Florida so I’ll be praying for recovery in your area. Thanks again! First, realize that grades are meaningless garbage. They were garbage in school — they have no application to real life in school or after it. Second, there’s no grade on this quiz. Your results just where you’re starting, where you have strengths and weaknesses. It’ll give you some hints on areas where you can focus your attention if you want to do this. Third, college is absolutely unnecessary if you want a career as a professional writer, and people who go to college to become writers almost always learn destructive processes that they have to unlearn if they want to succeed. I cover this in a different article, which you might find helpful. This is really helpful and encouraging, so thank you Mrs Lisle! Your other article answered a lot of my questions. If you don’t mind me asking (and I swear I mean no offense), but you mentioned you never attended college. Clearly, you’re an accomplished professional writer, but do you know any friends who went to college to further their writing career and regretted it? Thanks for the immediate response, by the way! Yeah. I have a long list of colleagues who went to college to learn to write, didn’t, had their goals derailed into other paths, and came back to writing through my classes. Look for the blue boxes. Yes, I just got a lovely 68 and I am happy. Thank you for your amazingly structured test. I love writing and currently wroting on Wattpad… 🙂 I hope I will definitely do better in future though. what is your name on wattpad? im also on there. I got a 52, did some writing in high school but didn’t really complete the books. I dealt with fantasy and fiction, not really pursuing a career in writing but would love to write some books that I might not even publish. Do you think it’s possible to get good at writing even if it’s not my career choice? Although I still push myself to constantly be better. I’m a bit of a perfectionist, if I’m doing something I like, I always want to be the best I can possibly be at it. Constantly trying to improve. That goes for all my hobbies really. Video games, writing (definitely my least active hobby, still enjoy it a lot though), graphic design, video editing, that kind of stuff. Got a 78! I don’t particularly enjoy writing in general, but when I’m writing for fun(writing a short story or continuously working on a “book”)it really lets me use my imagination and creativity in a different way! I’m only 11 great imagination.. Or so I’m told. And I got 49! I’m writing fantasy Adventure books, and apparently.. I think I can do it! Thanks for the inspiration! Can’t wait to get started!! Go get ’em, Kylie! You can do this.